The unseen secret to comfortable feet, a pair of Elle Low Cut Bamboo Shoe Liners with Silicon Heel Grip will let you turn any shoe into a pleasure rather than a pain. With a new, even lower cut seamless top, these shoe liners are near-invisible and super-kind to feet, made using skin-friendly bamboo - three times more moisture absorbent than cotton, naturally odour-resisting, anti-bacterial and hypoallergenic too. 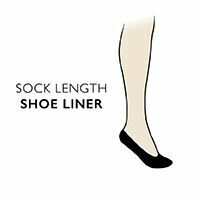 Elle Low Cut Bamboo Shoe Liners with Silicon Heel Grip are silky and smooth, with a cute ‘Elle’ logo hidden in the weave. Silicone heel grips ensure that they stay in place, without slipping underfoot like inferior versions.